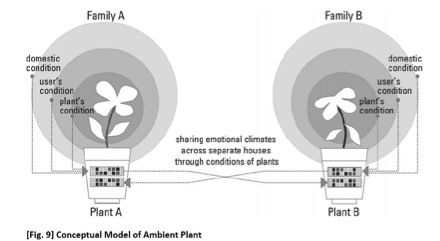 The ambient plant design concept seeks to (i) provide separated family members with a sense of social connection through the presentation of ambient information and (ii) provide family members with a sense of each others’ presence. Based on our literature review, ethnographic inquires, and cultural probe analysis, we determined that our target population exhibits a strong inclination to maintain social connections with their close family members and friends. The ambient plant supports and stimulates these social connections through a series of ambient displays of LED lights integrated into the pot of a normal houseplant. Informal discussions with out participants revealed that when they are experiencing stressful times or a very busy day, they generally tend to neglect their house plants – revealing a key indicator of a household’s shifting emotional climate. Furthermore, our participants noted that they commonly took care of a wide array of different types of plants within their homes.The ambient plan is intended to connect family member living in separate homes by sensing the moisture levels of the living plant and displaying this information through a series of colorful LEDs on one display located on the plant pot. Along with these readings, the moisture level information from the participants’ separated family members’ household plant is also displayed. The ambient plant pot allows members from both households to keep track of the well being of each others’ respective plants. In this context, the familiar everyday practice of watering and caring for the plant is transformed into a symbolic act to check in on the condition of close family members as well as the broader emotional climate of their domestic household. Additionally, when a family member is standing in front of their plant, the connected pot within the separated household begins to glow brightly to convey a loved one’s temporary presence. These surprising, ephemeral moments are likely to result in a stimulating period of time characterized by a participant’s interpretive reflection on what family member may be doing. Additionally, our target populations’ previous familiarity with caring for househ0old plants and the use of simple, easy-to-see ambient light displays collectively address and bypass usability problems commonly associated with elderly users and more traditional types of computing devices. The ultimate desired outcome of the ambient plant is not to replace direct forms of communication (such as telephone or face-to-face interactions), but rather to support social connections among separated family members through subtle enrichment of an already existing domestic object and practice. Note: This project has been decommissioned, but the idea is currently being iterated in the ambient clock. Student researchers: Heekyoung Jung, Micah Linnemeier, Will Odom, Selvan Thandapani and Richie Hazlewood.